It's been almost a month since the Guerrilla Gardeners Downtown Planting, and I've been visiting the garden on a regular basis to water it and make sure things are going well. Two crazy things have happened. 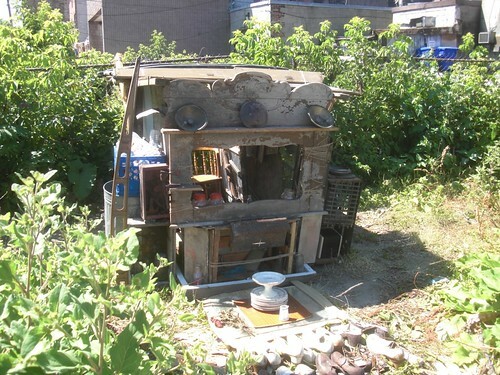 The first was the creation of a Guerrilla Shanty, a group of people literally built a totally awesome shack from a bunch of random materials, right next to our garden, so it was like there was someone living on that little patch of land. It included such authentic details as a variety of well used footwear out front, a (disassembled) computer off to one side, and a rocking chair with reading material and a water bottle inside. Super cosy! Shortly after it went up, however, it fell down (or was knocked down, it's impossible to know), and it became a huge pile of garbage. The lot was quite an eye sore for about a week. I failed to take pictures of this phase, partly because I wasn't in a hurry to do so - I figured it was gonna stay that way, or maybe the original shanty team (whoever they are) would come back and remake it, better faster stronger than the last time... but instead, it looks like the city came in. 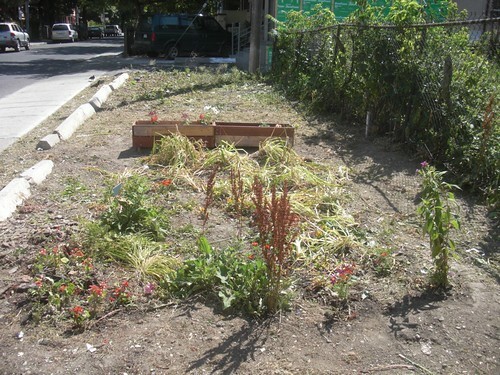 They basically had a scorched earth policy, nothing survived except for our garden - all the garbage, all the weeds, everything in the fence row including my precious sunflowers, even our awesome arrow sign, it's all gone. The lot looks positively empty! I guess it's an improvement over the garbage, but it does leave our garden looking awefully lonely out there - it's even looking kind of odd in it's placement now, since there is like 3 feet of blank dirt on all sides, where the native plants (burdock, etc) used to be. Anyway, it's been interesting to watch the plot evolve over time, and I'm getting some pretty good exercise hauling water out there every few days, so everyone is winning :-). I have a small flickr set for this followup. Question about City parks: Why so much grass. Why not more emphasis on trees and shrubs? Nice shack! You could paint it green for camouflage too! If I would live in there, I would only have food, computer and a cozy rocking chair... or probably I would convert our best computer chair to a rocking computer chair - 2in1 to maximize the space! I could live there forever.